Sorry for the terrible photo, it is from my phone. I know this photo is pretty bad, but these cupcakes are delicious so I wanted to share them with you. I had a rough morning Thursday (which included falling down the stairs) and forgot to take a photo before I brought them to work, I made these cupcakes Wednesday night for a coworker. She went out of her way to help me so I wanted to do something nice for her. I asked her what she liked and like most people she gave the "Oh, I like everything" response. A week earlier she happened to bring in some dark chocolate pomegranate candies which were addictively delicious. 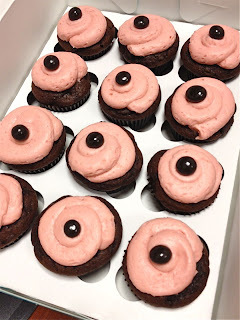 I immediately went to BJ's to pick some if the candies up (they topped the cupcakes) and they inspired these cupcakes. 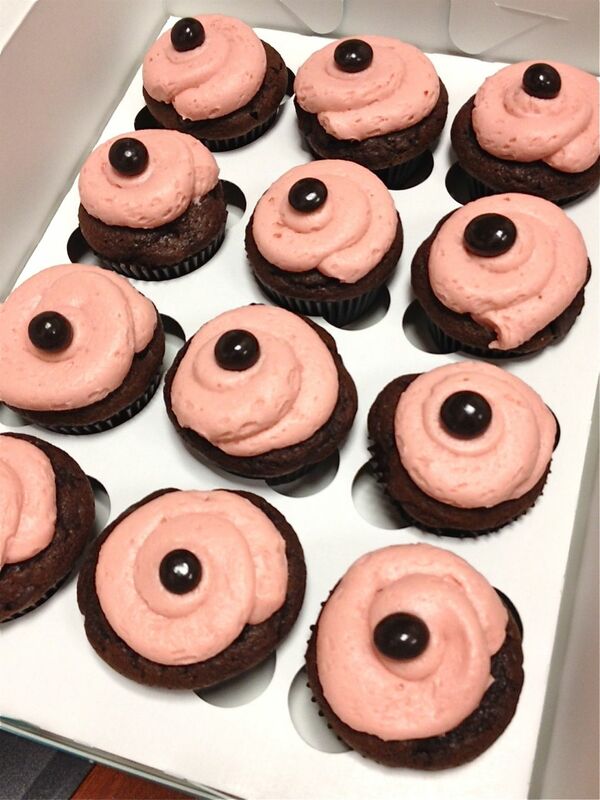 Now I must tell you that people seriously loved these cupcakes at work. Several people commented that they are better than Georgetown Cupcake and other DC cupcake shops. Three people even asked me if I can do parties for them. I think they would be a great addition to a Thanksgiving or Christmas Dessert Table. In a small sauce pan bring the pomegranate juice to a boil over medium-high heat. Continue to cook until sauce has thickened and reduce to 1/3 cup. Set aside to cool. Cream the butter on medium speed until it is very light in texture. Add the cooled pomegranate juice, salt, and vanilla. Slowly add the powdered sugar and mix on a low speed until the sugar and butter are blended, scraping down the bowl with a rubber spatula as needed. Increase the speed to medium, with the mixer running, add the milk one tablespoon at a time until you reach the desired consistency.